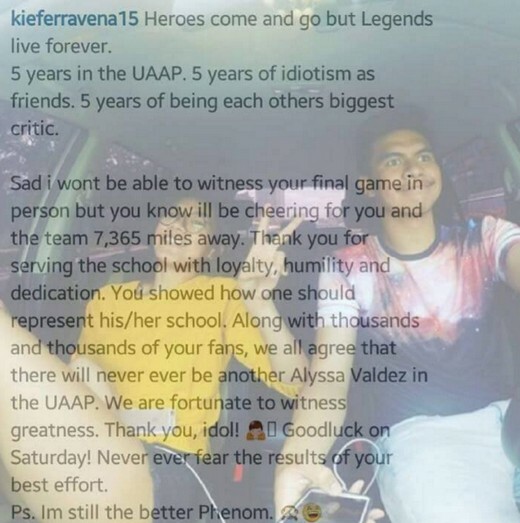 Kiefer Ravena wrote a Letter to Alyssa Valdez for UAAP Season 78 Women's Volleyball Finals Game 3: Read it here! Editorial warning, this letter will trigger overflowing emotions. Don't read it if you are a diehard fan of the one and the only Alyssa Valdez of the Ateneo Lady Eagles. She's nearing her final game in the UAAP and her boyfriend Kiefer Ravena, a fellow phenom expressed his full support to Alyssa en route to the all important winner-take-all women's volleyball finals game 3 on Saturday. Sadly, Kiefer won't be in the stands to watch his girlfriend do her thing, but one thing is for sure, he will be cheering for her from a distance.